The movie won the prize of the Golden Fox Awards, where the film's director also took part. 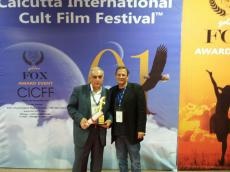 Shamil Aliyev was presented the main prize of the film festival - a statuette ‘Golden Fox’. “This is the victory of the entire domestic cinema, which is waiting for many more awards of international festivals,” he told Trend Life. The film was awarded ‘For Fairytale Reality’ at DIDOR International Film Festival -2012, ‘For creative research’ at International Telekinoforuma "Together" -2013, Uluslararas? Van Gölü Film Festival? -2014, Rainbow Film Festival - 2014, "Platinum Awards" at International Movie Awards -2014, Noida International Film Festival-2015 and others. The Steppe Man was included in the list of candidates of the American Cinema Academy OSCAR-2014 in the nomination "Best film in a foreign language".